Ready to learn how to fly fish? ​You're going to look just like Brad Pitt! Well... you know... except for being all handsome and chiseled and whatnot. If you've always wanted to learn to fly fish, you have a lot of options to choose from. You can buy a cheap rod and a casting video. If you buy a rod at a fly shop, they'll usually even throw in some parking lot casting lessons for free. That's a nice thing, but it's not enough. I have a few more options for you, and one of these is likely at a price point within your budget. In two hours, you'll learn the traditional back-and-forth cast, the roll cast, the water load, the reach mend, and you'll be able to mix and match them on the water to get a clean drift... because we'll be doing this on the water! Fee is $100 for one or two students. 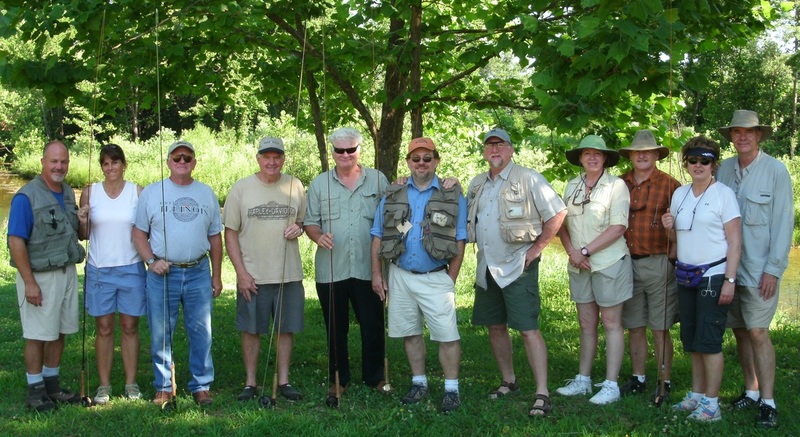 The Beyond the Basics fly fishing class, held at Westover Farms trout ranch, is by far the most complete and exhaustive scheduled group workshop I offer. We'll cover equipment function, knots, casting, mending, river structure, trout behavior, insect life, fly selection, multiple techniques, properly playing and landing fish, and problem-solving a trout stream from scratch. PLUS plenty of guided fishing at Westover Farms. 8:00am until dark (or you're tired of fishing). Loaner gear, tackle, and lunch provided. Max 8 students. ​$200 for singles, $350 for pairs. This event at Westover Farms is for kids ages 8-12 and offers just enough education and practice to get your kid hooked on fly fishing! It's a super-fast morning of casting lessons, fly selection, and nymph fishing. Lunch is hotdogs on the grill. After lunch, we'll have a casting competition, and then some free time for more fishing. NOTE: one parent or adult must be in attendance to help supervise the kids. Max 8 students. Private lessons can be whatever you need them to be. Any number of days. Lodging can be included, as can meals, and loaner equipment is always available. Wanting to be prepped for a big salmon fishing trip to Alaska or Wisconsin? I'll get you ready. Heading to Montana to for a week on the Bighorn? I'll get you ready. Just wanting to take a weekend to learn what it means to fish a spring creek? Easy Peasy. Whatever you need, we can make it happen. Due to my own schedule becoming exceedingly tight, I no longer schedule class dates in advance. If you're interested in learning to fly fish, just shoot me a message with what you'd like to accomplish, and we'll work something out. With enough interest, I still organize structured classes, but private lessons are always available and more affordable that you might think.